Water Turbines are developed from water wheels which were used in old days. Nowadays Water Turbines are used to convert hydraulic energy into mechanical energy. There are different types of water wheels used according to requirements. At present, Water Wheels has no more use in practice but as a mechanical engineering professional, we have to have knowledge of this useful invention. In these types of a water wheel, the water enters into buckets at the top of the periphery. Actually, this wheel runs entirely by weight of the water. But some it may run by the impulse of the water. The water from the slightly upper position, which is called as the head race, is allowed to enter into buckets through an adjustable sluice gate. The buckets are forced downwards due to the weight of the water and water wheels starts rotating. The water filled buckets are get emptied in the lower position, called a tailrace. To utilized maximum water energy, the buckets are arranged in the proper manner. Hence the crown of the wheel made slightly below the head race. The water strikes the buckets at some initial velocity. So, the wheel starts rotating partly by an impulse of the water. Overshot Water Wheel is useful in water head from 10 to 25 meters. Hence for such a high head, the diameter of the wheel is from 3 to 20 meters. We can achieve 60 to 80 percent efficiency from this wheel at 4 to 8 R.P.M. (Rotation per Minute). The 8 to 10 numbers of buckets are sufficient in its construction. 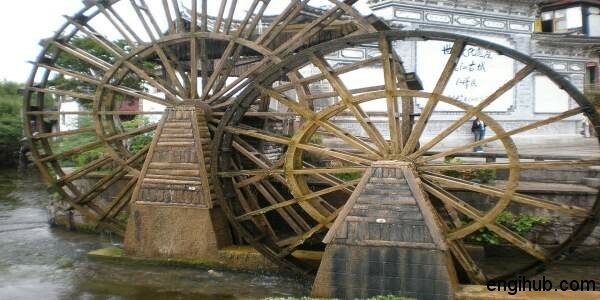 In this type of water wheels, the water enters the buckets at the breast height of the wheel. Hence wheel runs partly by weight and partly by an impulse of the water. With the help of rock and pinion arrangement, the water from the head race is entering the buckets without shock through a number of passages. So, the wheel starts rotating due the weight of the water and buckets start moving downwards. Breast Water Wheel had two main special features, first is its bottom is immersed in the tailrace of the water and second is the diameter of the wheel is more than the head of water available. This water wheel is useful in 1 to 5 meters water head, with diameter 4 to 8 meters. The efficiency of this water wheel is 50 to 60 percentages at 3 to 7 R.P.M. In this type of water wheels, the water in the form of jet impinges on the vanes at the bottom of its periphery. Hence this wheel entirely runs by the impulse of the water. The jet of the water strikes on the vanes and this makes a wheel to rotate. Before water strikes the buckets or vanes of the wheel, the available water head is first converted into velocity head. Undershot Water Wheels is useful where available water head is less than 2 meters. Hence the diameter of wheel 2 to 4 times of water head. The efficiency of this type of wheel is only 35 to 45 percentages at 2 to 4 R.P.M. This is the improvement of Undershot Water Wheels. In this type of water wheel, curved vanes are used to replace straight vanes. Hence this wheel entirely runs by the impulse of the water. The vanes are curved at such an angle so that the jet of water enters the vanes without shock. The water flows down to the tailrace without spill over at the outlet due to its sufficiently long vanes. The Poncelet Water Wheels is useful in 2 to 3 meters water head. At a diameter of the wheel is 2 to 4 times of the water head. The efficiency is 50 to 65 percentages with 2 to 5 R.P.M. The inlet angle of the vane is 15 degree. Water wheels are no use in hydroelectricity generation. Will you like to know, how hydroelectricity is generated?